2/15 New chart and written directions added. Enjoy! Please share links back to this page. Arcade: a series of arches supported by columns. A blend of texture, lace and cables, this pattern shows off your yarn and knitting skills. Complex, but easy to knit, this cowl will fly from your needles. You will stay warm and look good. 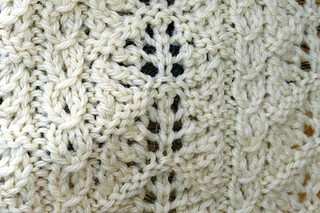 Any aran or bulky weight wool will work, just check your gauge if you want the same size garment. 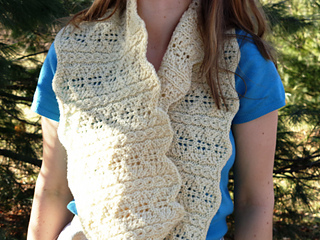 This cowl was knit using Interlacements Vixen. It is 120 yards in 3.5 ounces. You will need 3 skeins. Please link your project to the Arcade Cowl Ravelry page. Adding it to your favorites or Queue helps as well. Round 3: P, Slip 3rd stitch over 2 stitches on LN, k1, yo, k1, p, k2tog x 2, (yo, k) x 3, yo, ssk x 2. Round 4: P, k3, p, k11. Round 5: P, k3, p, k2tog x 2, (yo, k) x 3, yo, ssk x 2. Cast on 256 sts, keeping tension relaxed. Join to knit in the round, don’t twist. Place stitch marker for beginning of round. Repeat stitch pattern 16 X’s per round. Knit round 1-8 6 X’s, then rounds 1, 2 once more. Cast off, again with relaxed tension. Wet block cowl, shaping as desired. Wear! Enjoy the warmth and look good too. Affliate link: I am now an ebay affiliate. Clicking here before shopping helps support this blog, and doesn't cost you anything.